A very intense and creative thriller that is part horror movie and part sic-fi thriller. This movie is a hell of a thrill ride. It’s a true mystery surrounded by equal parts suspense and sci-fi. A girl wakes up in a bunker, chained to the side of a bed, and is told that the world as she knows it, (up above her) has come to an end. She’s now stuck living in the bunker with people she doesn’t trust, and continues to learn more dark secrets about. The movie really captures your paranoia and, other then a slightly flawed ending, is pretty excellent. When it comes to alien / sci-fi movies these days, the best name in the business is J.J. Abrahms. Here’s a guy who knows how to give us the thrills we’re after, but first surround them in mystery and suspense. He feeds our appetites for curiosity before his movies deliver on the goods. Abrahms directed the movie Super 8, about a monster in a small town. 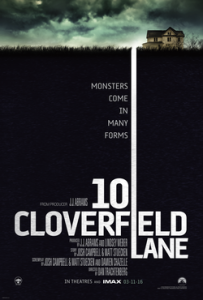 He also produced Cloverfield (about a monster in a big city,) and now has produced 10 Cloverfield Lane, a movie where you just don’t know, and spend most the movie wondering. All three films are pretty great. Abrahms is also the guy credited most with writing and producing Lost, a TV show where a good deal of the events centered around a mysterious bunker or hatch. This is worth consideration because 10 Cloverfield Lane combines the hatch setting with the mysterious / possible alien situation, and does so flawlessly. What’s especially impressive is that the film wasn’t even written as a Cloverfield movie, but instead was meant to be something else. Something completely human. And yet, just by changing the ending, they were able to transform this movie into something that would fit in, right alongside those others. The film is about paranoia and human suspicion. In many ways it’s a “what would you do if you woke up in this situation,” kind of film. It is part horror movie, not so much because of graphic content (which there isn’t really,) but because of the thrills, suspense, and initial scenario. That scenario is of a girl (Michelle,) who wakes up in a small dimly lit room, lying on a matress on the floor, chained to the side of the bed. She has no idea where she is or who put her there. Sounds a lot like the setup to a Saw movie, right? Turns out this is just the opening, and the film goes in a very different direction after that, (meaning Michelle is not confined to this room or this situation for the entire movie.) But what a setup. As it happens, the movie began just a little earlier than this with Michelle driving around at night, listening to a message from a boyfriend, who she just broke up with, offscreen. Now, as she drives away, her car is run off the side of the road by another vehicle and left upside down in a ditch. That’s when Michelle wakes up in the room. There’s an I.V. machine next to her matress, and then the chain around her leg. We hear the footsteps and sounds of a man walking into the room. We even hear him breathing. And after a hell of a setup (where we don’t even see him or see what Michelle sees for a few moments,) we finally meet Howard, (John Goodman.) This is one crazy character. He starts out by explaining to Michelle that the air above them has become contaminated by some kind of invasion, and that they will need to spend the next year or two down here, in the bunker. Of course Michelle thinks this is all madness. She makes a wooden stake out of her crutch and tries to stab Howard with it. That leads him to try to convince her more. She introduces her to another guy who is living there with them, Emmett, and gives her a tour of the bunker. There’s a common room with a TV, couch, kitchen, and dining room table. There’s the pantry and food storage area, where Emmett sleeps. There’s Howard’s bedroom which has the only toilet / bathtub in it. And turn there’s Michelle’s small, yellow room with the dim lighting and matress on the floor. I love the way this movie lets us learn the layout of the bunker enough to almost make us feel like we are there. Michelle questions Emmett. She tells him that Howard abductees her, and that he’s crazy, and that they have to get out of there. Emmett explains to her that she’s wrong about the invasion being made up. He saw it himself and came here, to the bunker, on his own free will, begging Howard to let him in. Part of me wishes that Michelle questioned Emmett more about this, finding out exactly what he saw, but then another part realizes that the less we know, the bigger the curiosity and surprise at the end. It’s all buildup and manipulation. When Michelle does escape one night, while sitting around the dinner table, and makes it to the top of the hatch, she is trying to unlock the door when a woman runs up to it, begging to be let in. Her fact is all cut up and destroyed, and when Michelle hesitates, the woman starts banging her head against the door. That’s when Muchelle realizes, for the first time, that this threat above might actually be real. It’s time for the next development and surprise. First we get some montages of Michelle settling in, making herself at home, redecorating a little, and coming to terms with her situation. But not long after they a new mystery arises, involving something that one of the characters might face done, and this one is even better than the last. They say the stakes need to keep rifling as a movie goes on. This film definitely has that element working for it. With all of the suspense surrounding the characters and who they really are, it’s amazing that this movie still has room for an ending which is out there, and creative. Ironically, with how great the thrills were leading up to this, the final scenes of the movie, which bring in a whole new problem, are some of the weaker moments of the film. And yet they do everything they’re supposed to do. Trey answer our questions, give us a new development or twist, and are bigger in scale than anything that proceeded them. It’s just that the ending kind of feels tacked on. I’m not sure what I would have preferred, or if there really was s better option out there, but something just doesn’t feel right. Perhaps that’s a testament to how great the movie we leading up to this. It’s a fantasticly suspenseful and interesting and oftentimes creative and compelling movie.